Our range of products include excavator undercarriage parts. 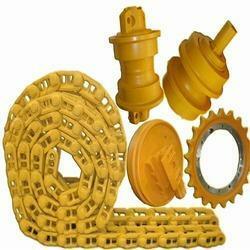 Bharani is the trusted name of the industry that provides a wide array of Excavator Undercarriage Parts. Precisely designed and developed, these parts are quite efficient in their performance and vastly popular of their reliable performance and dimensional preciseness. These undercarriage parts are provided in various specifications to cater to the diverse customer requirements. Looking for Excavator Undercarriage Parts ?